The Ray Downey Courage and Valor Award commemorates the life and career achievements of Deputy Chief Ray Downey, who lost his life while commanding rescue operations at the World Trade Center attack on September 11, 2001. Deputy Chief Downey was chief of rescue operations and a 39-year veteran of the Fire Department of New York. He was the most highly decorated firefighter in the history of FDNY. Deputy Chief Downey commanded rescue operations at many difficult and complex disasters, including the Oklahoma City Bombing, the 1993 World Trade Center Bombing, and many natural disasters worldwide. Each year, the award is presented at the Fire Department Instructors Conference (FDIC) International in Indianapolis, Indiana. The recipient of this year’s award is Lieutenant Bradford T. Clark, of Hanover County (VA) Fire-EMS. The award will be presented posthumously, with his wife Melanie Clark accepting the award. On October 11, 2018, Hanover Fire-EMS was managing heavy call volume because of the impacts of Tropical Storm Michael when Lieutenant Clark’s unit, Engine 6, was dispatched to an accident on the Interstate highway at 21:00. As the crew was dismounting the apparatus to size up the incident, Lieutenant Clark observed a tractor trailer speeding toward the unit as he rounded the front of the engine. Rather than using this moment to jump to safety, Lieutenant Clark yelled to warn his crew, allowing them a split-second notice to gain cover and brace for impact. One firefighter who was riding behind Lieutenant Clark was reaching back into the jump seat to retrieve a medical bag when he heard Lieutenant Clark’s warning. Sensing the impending impact, he dove headfirst back into the cab as the tractor trailer struck the rear of Engine 6. That firefighter emerged from the wreckage without significant injuries and was able to begin treatment of his fellow firefighters. The driver of the Engine 6 and other jump seat firefighter received significant life-threatening injuries as a result of the impact. The impact of the tractor trailer drove the engine over the top of Lieutenant Clark, pinning him underneath the fire apparatus. Crews worked to free him and begin treatment, but in spite of their best efforts, Lieutenant Clark was pronounced dead at the scene. Lieutenant Clark’s selfless actions resulted in the survival of the rest of his crew. Lieutenant Clark used his last second to warn his crew, which gave them just enough warning to survive. Lieutenant Clark’s actions exemplify the highest traditions and values of Chief Ray Downey and those firefighters who gave their lives on September 11, 2001. 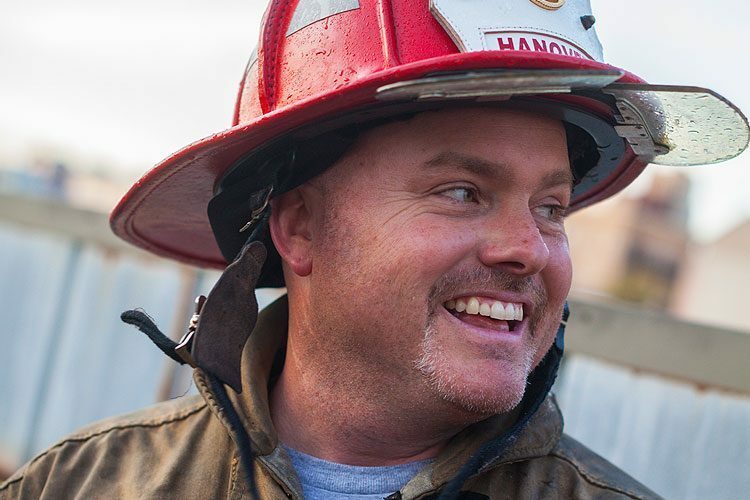 As such, the 2019 Ray Downey Courage & Valor Award is presented to Lieutenant Bradford T. Clark, of Hanover (VA) Fire-EMS. Melanie Clark will accept the award on Lieutenant Clark’s behalf during Opening Ceremony Day 1 of FDIC International on Wednesday, April 10, 2019, in Indianapolis, Indiana. The award includes the Courage & Valor Medal and a check for $35,000, on behalf of the Courage & Valor Foundation. Donations to the Courage & Valor Foundation can be made at www.courageandvalor.org. Register for FDIC International 2019 at https://www.fdic.com/index.html.